The Vigo Bridge is called the balcony of the town, because of its position as it looks out over Venice Lagoon. It represents the town business card, for the gorgeous view it gives to people arriving from the lagoon or the sea. 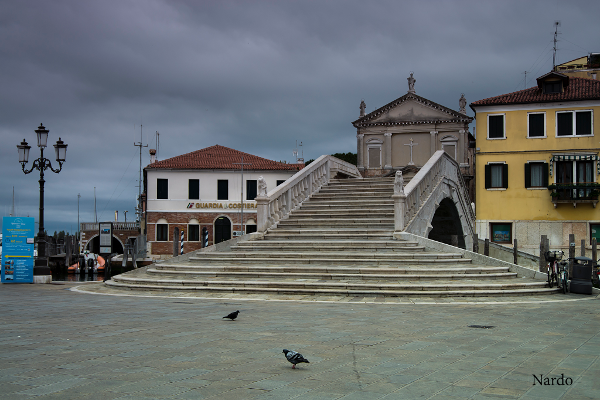 The Vigo Bridge is a symbol for Chioggia inhabitants and it is probably the most photographed monument in Chioggia, as well as the source of inspiration for the film-making industry, that on several occasions chose it as a natural set. The bridge’s history is quite ancient. Story goes that even during the War of Chioggia some fights were fought on this bridge. Therefore, it existed already at the end of the 14th century and the beginning of the 15th century. Originally it was made of wood and was later built with stones by the chief magistrate, Podestà Morosini (1684-85). A memorial stone on the bridge northern arch recalls the names of the Podestà, the council members and deputies in office during the building of the bridge. Marble decorations, balustrades and small lions were built at a later time in 1762 by the chief magistrate Girolamo Arnaldi. Thanks to the presence of a lantern placed on the bridge since 1796 by the chief magistrate Angelo Memmo, it became a reference point for sailors, so that they were able to easily see the harbour’s entrance, especially on dark and stormy days. The arch is made of masonry but the whole bridge covering is made of Istrian stones. The same material is used on the balustrades, composed of columns and bas reliefs, that adorn both the facades of the bridge. Among the bas reliefs, the northern one represents the Annunciation, and the southern one represents the Patron Saints. Even steps and handrails are made of Istrian stone, whereas the floor is made of trachyte blocks. Parapet’s columns are decorated with four lions and shields that represent respectively a winged dragon, the name of podestà Arnaldi, a lion rampant, while the fourth one is no more recognisable.